The National Kidney Foundation (NKF) Serving Texas held free kidney screenings on World Kidney Day, March 8, at the Dallas County Health & Human Services Department. The community received a risk survey, blood pressure check, body mass index measurement, an opportunity to speak with a healthcare professional, free educational materials and for individuals at risk, an ACR urine test for albumin. Taken on World Kidney Day, March 8, at the free kidney screenings at the Dallas County Health and Human Services Department. 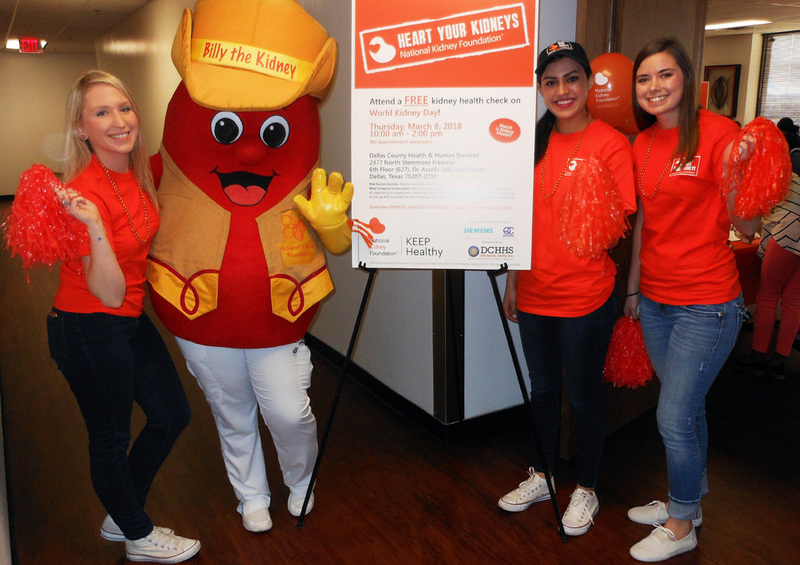 Pictured here are members of the National Kidney Foundation Serving Texas: Amanda Crowley-Rios; “Billy the Kidney” Maria Torres, a nursing student at Dallas Nursing Institute; Vanessa Garnica, Jennifer Moore. More than 30 million American adults are estimated to have kidney disease, the 9th leading cause of death in the U.S., and growing in prevalence. 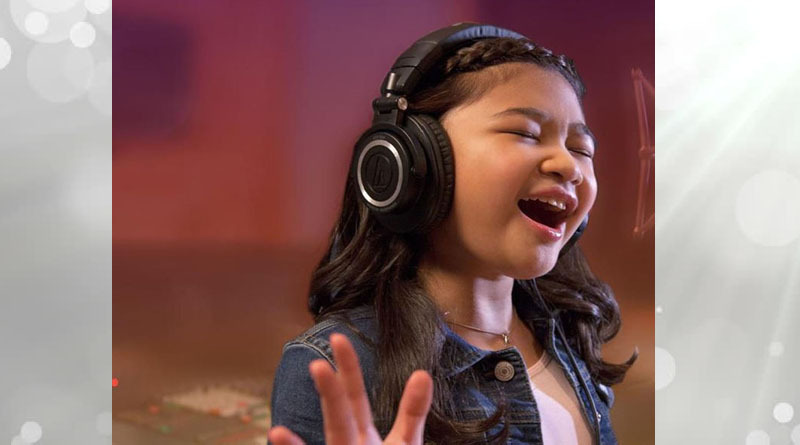 To further raise awareness among the young and the young at heart, NKF has partnered with 10-year-old America’s Got Talent singer and kidney transplant recipient Angelica Hale. 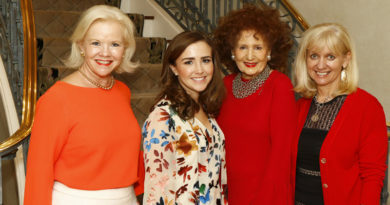 NKF and Angelica are advancing the “Heart Your Kidneys” public awareness campaign introduced last year to elevate knowledge about, and concern for, kidneys to the level of the body’s other, better-understood, vital organs such as the heart. People also need to know that kidneys are the foundation for a healthy heart. Kidney healthy is also heart healthy, so when you “heart your kidneys,” you also show love for your heart! The number one cause of death in people with kidney disease is heart disease. 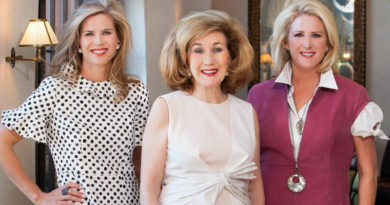 At age 4, Angelica’s kidneys failed. Her mother, Eva Hale, donated one of her own kidneys to her daughter to save her life. Today, both mother and daughter are healthy. Angelica’s story is a reminder that when your kidneys stop working, so do you. Dialysis or a transplant is needed just to stay alive. “Eat right, exercise, drink water, and keep your kidneys healthy, because whatever you’re good at, there is only one you,” said Angelica as part of a new series of “Heart Your Kidneys” video public service announcements she recorded for NKF. Also, earlier this week, Angelica became NKF’s newest face of kidney advocacy on Capitol Hill during this year’s Kidney Patient Summit in Washington, D.C., where she helped support key NKF legislative priorities. NKF Serving Texas urges anyone with diabetes, hypertension, or a family history of kidney disease to speak with their doctor this month, or anytime, and ask about getting tested for kidney disease. “It takes just two simple tests at the doctor’s office to check your kidney health. 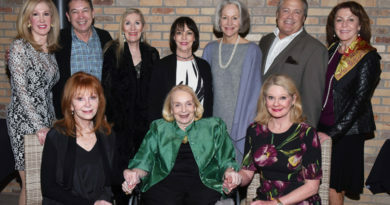 Even if you inherit kidney disease, you may be able to slow down progression of the disease with lifestyle changes,” said Neil Foote, local board chair. Join the conversation on social media by looking for and posting the #HeartYourKidneys hashtag. Featured photo of Angelica Hale courtesy National Kidney Foundation. ← April 14: Home Tour Tickets on Sale Now!